The University of North Carolina System is governed by confusion, and the problem is as much systemic as it is situational. Personal relationships and organizational uncertainty make it tough for UNC to function without conflict — and to manage its public image, says Andy Taylor, professor of political science at N. C. State University. Former UNC System President Margaret Spellings summed up the situation during a press meet-and-greet in November, just weeks before leaving her job Jan 15. A veteran of politics and a former U.S. Secretary of Education, Spellings faced myriad crises during her short stint at UNC. House Bill 2. Confederate statue Silent Sam. Board politics and leadership. For Spellings, the many narratives could be traced to a core conflict. “This is a story about governance. … Just a lot of, ‘Who’s in charge here?’ kind of stuff,” she told reporters in November during a final press gathering. After months of growing tensions at UNC-Chapel Hill over the fate of its felled Confederate statue, a board-led rejection of Spellings’ candidate for the open chancellorship at Western Carolina University, and visible strain between Spellings and UNC Board of Governors Chairman Harry Smith, the outgoing president avoided questions about how much UNC’s governance factored into her decision to leave. She did, however, give her personal assessment of the larger situation. Spellings entered the North Carolina scene as legal battles were the norm — the governor, the superintendent of Education, the State Board of Elections, General Assembly. That amount of dysfunction should summon questions, she said. The question lingers, even three months after her departure. The UNC System is a wide-reaching umbrella with power that ultimately belongs to members of the North Carolina General Assembly. The legislature appoints members of the BOG. The BOG hires or fires the president. 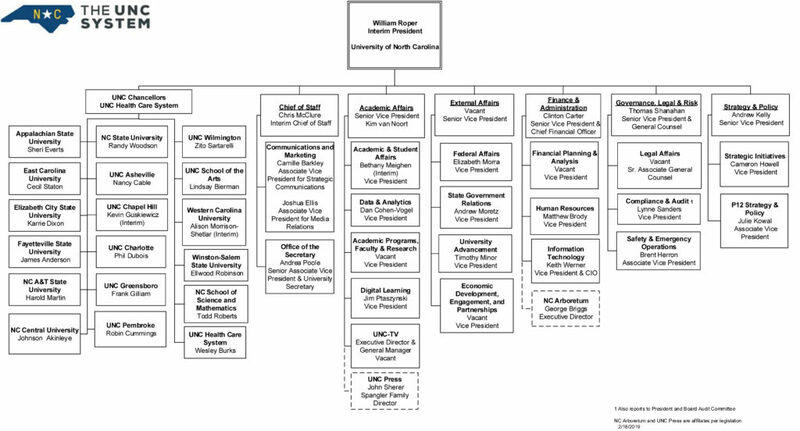 The president presides over the chancellors of UNC’s 17 campuses, the system office, and UNC Health Care. But the system’s leadership flow-chart fails to detail the BOG’s relationship with campus boards of trustees, or even illustrate the amount of interaction the governing body should have with the schools and chancellors. It’s a tangle of undefined roles, as demonstrated by recent events. 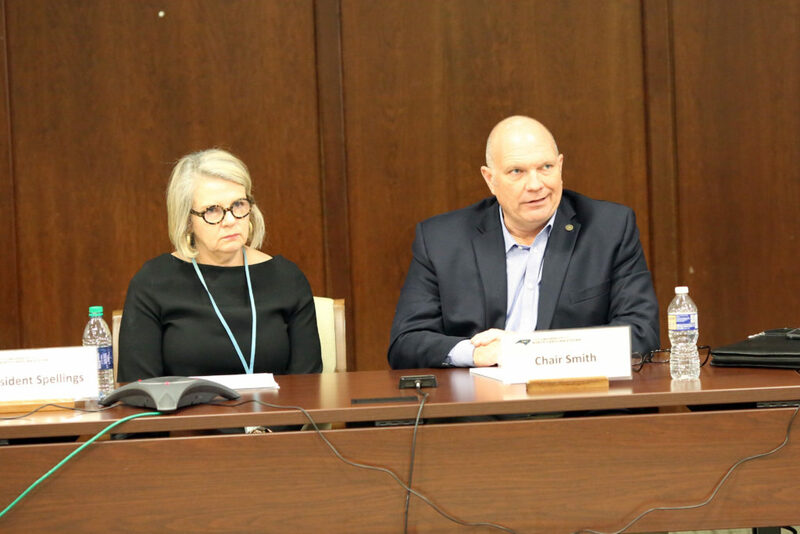 UNC’s politically experienced interim president, Dr. Bill Roper, and powerful chairman, Smith, have publicly touted the success of all 17 UNC schools. They’ve also called for more transparency and accountability across the system. But while some successes are prominent, the optics don’t always line up. While Roper transitioned from the top spot at UNC Health Care into his new role at the system office, Carol Folt resigned as chancellor of UNC-Chapel Hill, giving the remnants of Silent Sam the boot on her way out. When it came to dealing with Silent Sam, Folt’s hands were tied by a law prohibiting the removal of historic monuments without express permission from the N.C. Historical Commission. After protesters toppled the Confederate monument, Folt was tasked with finding a home for Silent Sam that both complied with the law and satisfied the UNC-Chapel Hill community. The historical commission punted on the decision, and the Board of Governors assigned Folt and the UNC-Chapel Hill Board of Trustees to come up with a solution. The campus recommended the statue be housed on campus in a history center that would cost $5.3 million to build. The BOG rejected that suggestion. Instead, a special committee of board members will decide the statue’s fate. That conversation is ongoing. The timetable for resolution keeps being pushed back. Trusted sources told CJ in November that Staton had plans to step down by Jan. 1, and that discussions of a large severance package were in process. At the time, Staton flatly denied the reports. On March 18, Staton announced his resignation, saying he signed a non-disparagement agreement and that conversations about his resignation had been taking place for “some time.” He received an almost $600,000 severance package. The exits of Spellings, Folt, and Staton signal issues within the system, even if those difficulties are simply a public relations mess, Taylor said. In the case of Folt, the chancellor appeared to be mostly respected on campus, Taylor said. Folt was challenged in handling a convoluted political process to decide the fate of Silent Sam, ultimately facing opposition from many fronts, including the BOG. Exemptions from public records laws, such as the personnel clause claimed by Roper, allow board members to conduct much of their business in the dark. That lack of transparency does nothing to clear public doubt about the role of the board — and about how it functions in relation to the UNC System, Taylor said. When combined with strong personalities and political relationships, that dim light on board proceedings becomes a hazard, Taylor said. Some board relationships reached a boiling point in mid-March, when BOG member Steve Long released a public letter criticizing Smith after Staton announced his resignation. Long, who served as the board’s liaison to ECU, was an outspoken supporter of Staton’s, and he alleged Smith had a “personal vendetta” against the chancellor. Smith consistently tried to undermine the chancellor’s leadership after Staton refused to back a student housing deal the chairman wanted to make with ECU, Long wrote. “The public would be greatly disappointed and surprised if they knew the persistent and extreme actions that Harry Smith has taken to undermine Chancellor Staton as well as the hours of fruitless, wasted energy spent by ECU trustees and UNC System administrators addressing how to deal with Harry Smith and his daily threats and attacks,” Long wrote. Only a few days later, and after reports that he would be publicly censured for the letter, Long apologized to Smith and other board members for his handling of the situation during the board’s March 22 meeting. Long never apologized for what he said, but the matter was over as quickly as it began. Smith told CJ Long came to him March 20, and the two governors had a conversation. Long’s public apology followed. Long declined to comment for this story. Ultimately, the UNC Board of Governors reflects the will and power of the General Assembly. According to state law, members of the board are appointed by the House and Senate. In 1971, the legislature orchestrated the current board structure, turning it from a board of trustees into a governing body. The board was once composed of 32 members. In 2017, the legislature voted to cut eight seats from the table over time, reducing the BOG to 24 governors as some members’ terms end. The current board is composed of 28 members. That will drop to 26 in July. The body is full of differing opinions, but not necessarily of the partisan variety, said Senate Leader Phil Berger March 21. Berger, who holds tremendous sway over appointments to the board, pointed to successes of the body, particularly the turnaround— financial and otherwise — of Elizabeth City State University. “It was in bad shape,” Berger said. “Harry Smith has been a key person in helping to turn that campus around, and now I think there’s a lot of hope there and there’s a lot of confidence that things are moving in the right direction. “That’s a specific example, but there are a lot of other things that I would think are under the radar in terms of trying to consolidate some back-office stuff to make the university system more efficient,” he said. Some other specific examples of successes under the Board of Governors include implementation of the state’s NC Promise plan, a $500 tuition in-state tuition program at three campuses, including ECSU. The board also has improved relationships with the N.C. Community College System. Under the BOG’s leadership, and the direction of the General Assembly, the UNC System opened teaching programs at five underperforming public schools across the state. Additionally, the board, under the leadership of former president Spellings, put in place a strategic plan to set system wide goals for access, affordability, efficiency, student success, economic impact, and community engagement. While those accomplishments are notable, poor optics and transparency cloud the picture, Taylor said. Members of the general public, as well as UNC faculty, staff, and students, perceive the board as overreaching and problematic. In February, a group of former BOG members, big-name supporters, and campus faculty and alumni now exceeding 1,600 signed onto an effort called Reform UNC System Governance. The band, which included former BOG member and well-known Wilmington businessman Fred Eshelman, called out the body for “meddling and micromanaging.” It also called for a balanced and independent board. “We need less political influence and more civic responsibility,” the group’s website states. CJ reached out to Eshelman, but a representative said he wouldn’t comment. In March, former UNC President Erskine Bowles, a Democrat, and former Charlotte mayor and gubernatorial nominee Richard Vinroot, a Republican, penned an op-ed in the News and Observer calling for more balance and less partisanship on the board. While trimming the number of board members is a start toward more manageable, efficient government, it doesn’t clear much of the fog that hangs over the situation, Taylor said. Editor’s note: This story was corrected after publication. The original version overstated how many people signed the letter in support of Cecil Staton. We regret the error.